Gastric Bypass keyhole surgery is considered the world’s leading method for effectively treating morbid obesity. In Gastric Bypass surgery the stomach is made smaller by creating a new small pouch of 30-50 ml from the upper part of the stomach using surgical staples. The new pouch is connected directly to the middle portion of the small intestine, bypassing the rest of the stomach and the upper portion of the small intestine. Absorption of nourishment will be much slower, you will consume considerably fewer calories. The surgery is performed under general anesthesia using laparoscopic/keyhole surgery method by making 5 small incisions and using specific instruments and a camera to guide the surgery. Following the operation you will remain in the hospital for up to 3-4 days for a safe flight back home, if the doctor doesn’t specify otherwise. Because the anatomy of your digestive system will be completely altered during the operation, you have to follow carefully your doctor’s orders regarding your subsequent diet, the nourishments and physical activity. Recent studies show up to 93% long term success rate at post gastric bypass patient groups. Even though physicians recommend weight loss surgery as a health improving tool, we can also add extremely positive psychological and physical effects, longevity and improvement of life quality in general. 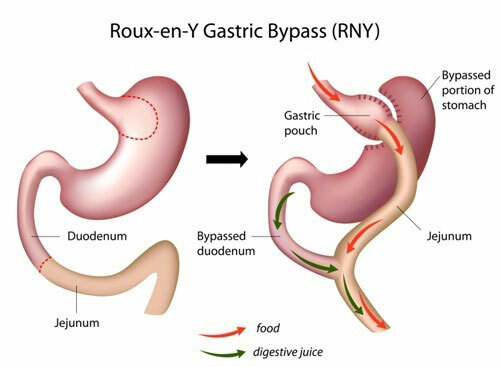 Read more about benefits of gastric bypass surgery here! Proper eating. The surgery limits the amount of food you can intake, and it becomes extremely important to intake the right type of food. Following a long term diet plan and understanding the value of products is a key to long term success of any type of weight loss surgery. Regular physical activity – consistent exercise is another key of a long term success of the weight loss surgery. Leakage from the stomach or intestine through the staples which can cause abdominal infection. Blood clots caused by surgery – Deep Vein Thrombosis, Pulmonary embolus. A rare complication. To avoid these risks, post-operative patients are given medications to “thin the blood” to help prevent formation of clots. Walking after the surgery is essential to avoid blood clots. Formation of ulcers in the stomach or small intestine. This is an uncommon complication. Ulcers are more common in smokers and patients taking medications for arthritis. Dumping syndrome. Usually can be caused by eating too fast or too much, or drinking and eating the same time, or maybe after eating certain types of food. You should follow recommended diet plan and monitor feelings after bringing back every product in your diet. Obstruction of the opening of the stoma. This is also a rare complication (1 in 100 patients). It can occur when a piece of food lodges in the stoma. If this happens, the piece should be removed endoscopically from the mouth into the stomach. Vitamin and/or iron deficiency. To avoid vitamin deficiency, follow your doctors or dietitians supplement recommendations and do not forget about regular follow-up by your GP! Read more about risks of the gastric bypass surgery here. Get to know more about our weight-loss surgery offer!